GEM Sisters Teach You How to Rock Their Merch + GIVEAWAY! | YAYOMG! GEM Sisters Teach You How to Rock Their Merch + GIVEAWAY! Whether you know the GEM Sisters from their hilarious YouTube channel or their Sister Detectives book series, one thing is for sure – Giselle, Evangeline, and Mercedes are completely amazing. At just 9, 11, and 15 these girls are taking the comedy world by storm! They are the largest female sketch comedy channel on YouTube with nearly 150 million channel views. These three real-life sisters live to have fun and inspire other girls with their funny skits, parodies, and extremely relatable videos. 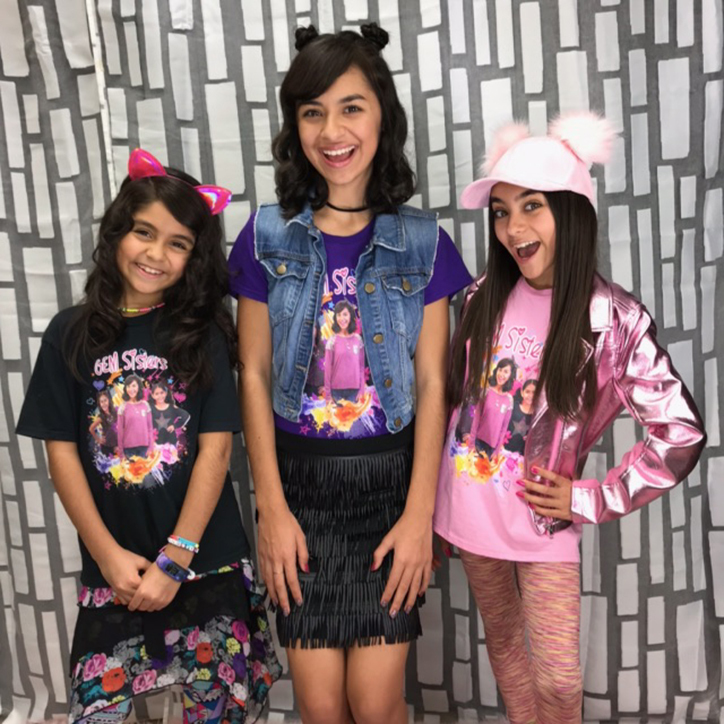 We teamed up with Giselle, Evangeline, and Mercedes for an amazingly fun Instagram Takeover and GEM Sisters Merch Giveaway! The girls recently released a brand new GEM Sisters t-shirt that they’re really excited about, so we’re collaborating to show them off and give some away! Check it out below, it’s a closet must-have, for sure! Inspired by their nique sense of style and passion for empowering girls to be themselves, we invited each of the sisters to take turns styling the new GEM Sisters t-shirt. They took over our Instagram to show off their amazing looks and step into the role of fashion icon for all their fans. (If you missed the takeover, it’ll be in our highlights!). 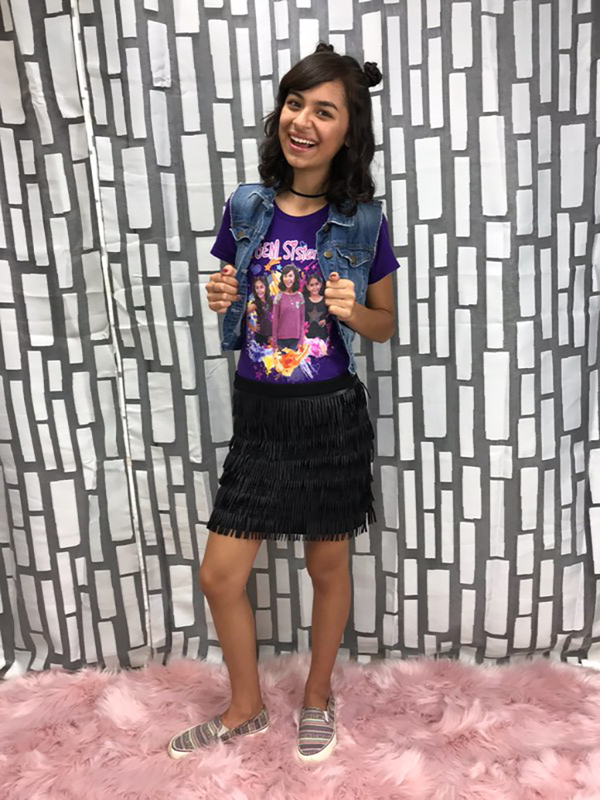 If you win a GEM Sisters shirt in our giveaway or already own one, be sure to tag @gem.sisters to show off how you rocked the look and made it your own. Take a peek at how Mercedes, Evangeline, and Giselle styled their looks below, get some GEM Sisters style tips, and enter the giveaway! Giselle’s fashion go-to? Denim! Giselle loves layers and can often be seen sporting a cardigan, vest, or jacket. To style her outfit, Giselle layered a cute denim vest over her purple GEM Sisters t-shirt. She completed the look with a chic fringe skirt and a simple choker. You can never go wrong with denim, so feel free to add denim accessories, like a scrunchie or mini-backpack, to put your unique stamp on the outfit that you style. Mercedes is known for her love of all things pink, so it’s no surprise that she chose the pink GEM Sisters tee for her look. To be style twins with Mercedes, you’ll need every single pink item you have in your closet. Hot pink, millennial pink, rose gold – if it’s a shade of pink, then it’s an option. 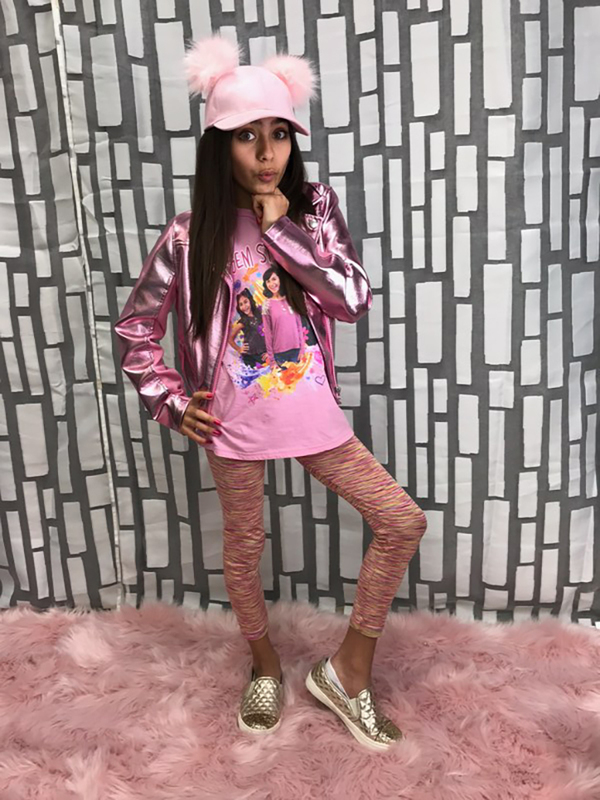 Mercedes look consists of her pink GEM Sisters shirt and fabulous metallic pink jacket, pink leggings, and rose gold quilted sneakers. Finally, she added an adorable pom-pom hat to complete the look. Yes, that was pink too! She looks super glam, and now you can too! If you know Evangeline, you know her style always includes lots of bright colors and wild patterns. She chose the black shirt because the colors in the GEM Sisters design really pop and stand out. 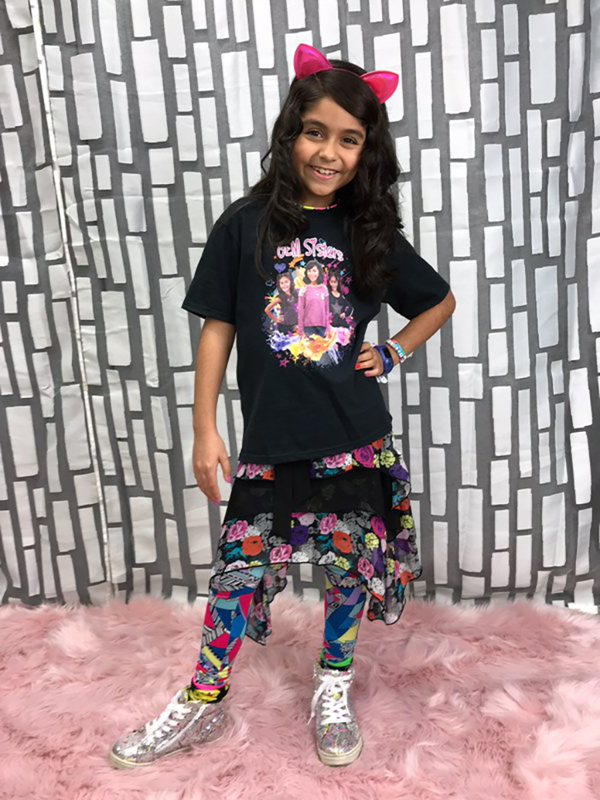 She couldn’t decide between her floral skirt or printed leggings, so she went with BOTH! Evangeline topped off the outfit with adorable shimmery kitty ears. To rock a look similar to hers, dig through your dresser for the boldest pair of leggings and your most vibrant skirt. Then, grab a pair of kitty ears that sparkles and shines as bright as your personality. Meow! Now that you’ve seen all the looks, it’s time to win a GEM Sisters shirt of your own! – THREE (3) lucky winners will receive a GEM Sisters Color Splash t-shirt in the size and color of their choice. Sizing: The shirt comes in Men’s (S-3XL), Women’s (S-XL), and Youth Sizes (4-12). For sizing info and to preview the colors, visit the Amazon page here. Get permission from your parent/guardian and fill out the form below by April 15, 2018! Giveaway begins on April 5, 2018 at 6:00 pm ET and ends on April 15, 2018 at 11:59pm ET. You must be 18 or older to enter. If you are under 18, you’ll need to get permission from your parent/guardian to enter and again if you win. Please provide THEIR email address when entering below. If chosen as a winner, you’ll need to provide contact info where we can reach your parent/guardian if you win. They’ll need to sign an affidavit permitting us to send your prize. Be sure to read the fully detailed rules HERE before entering. Note: Prizes will be ordered via Amazon.com and shipped out to the winners directly from there. Good luck to everyone who enters and thank you SO much to Giselle, Mercedes, and Evangeline for their fabulous fashion tips! Be sure to follow them on Instagram (@gem.sisters) and subscribe to their YouTube channel so you never miss an update!